How can we thrive, and not just survive, in the Silicon Valley? Join the 1500 Stories Project and Sacred Heart Community Service for two evenings of community building around economic inequality in the Silicon Valley. Come share your story, meet others in your community and discover ways to make a difference. On Thursday Oct. 11, 2018 from 7-9 pm in the Learning Center at Sacred Heart Community Service, we will share our experiences with economic vulnerability. 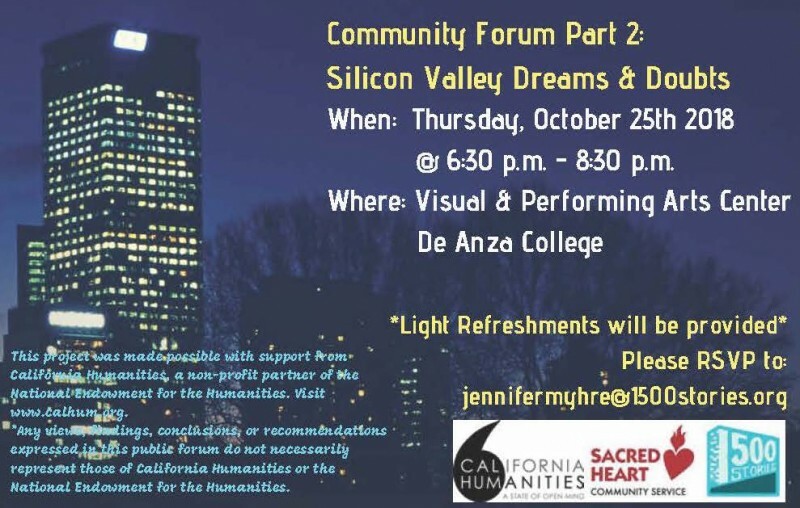 We will deepen the discussion on Thursday Oct. 25 from 6:30-8:30 pm in the Visual and Performing Arts Center at De Anza College, exploring our Silicon Valley dreams and doubts.